Being one of three girls growing up, there are some things about bringing up boys that mystify and slightly scare me. One of them is haircuts. Grow the hair long and just trim it once in a while. Grow the hair long, but keep a fringe and trim it regularly; ideally before the hair starts needling the eyes. Cut the hair short. Basically, choose a picture from a magazine, or Pinterest, and take it to the hairdresser and watch as they do their magic. You would think that boys would be far simpler! How many variations of close cropped hair can there be? And, until now, hair cuts have been a very simple affair. I have sent them to my mum and she has set to work with her comb and scissors until the hair seemed to be at an acceptably short length. 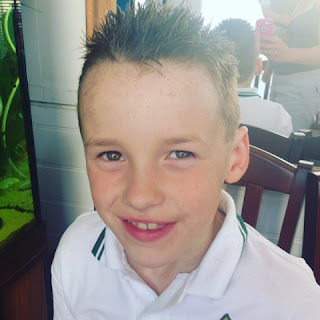 But over the past year, Elliot has become more interested in things like hair gel, styling products and attempting to copy the hairstyles of his favourite footballers - particularly Eric Lamela and his spiked up style. Unfortunately, his current grandma hairdo was no longer cutting it. As his interest in his appearance started to develop, I felt the need to do a bit of research to try and help him develop his own style. I resorted to Pinterest, started a boy hair board and discovered that boys' haircuts are not just limited to the 'short back and sides'. You can have floppy fringes, spiked tops, over the ears, swept to one side and any variation of these and more! I then discovered a new problem: types of hair. My mother had often struggled to cut Wilfred's hair because it is extremely straight and very dense, so it seems that some of the lovely hair styles I had found would probably be unsuitable. Things came to a head this week when I realised the school photographer was coming in to take some class photographs. My boys were in need of a haircut and something had to be done. So, we went into town after school and visited Phyllis's Seaside Barber Shop, which is where my husband has his hair cut. We were lucky, she was about to close up shop for the day, but she took pity at the desperation in my face and managed to fit us in. 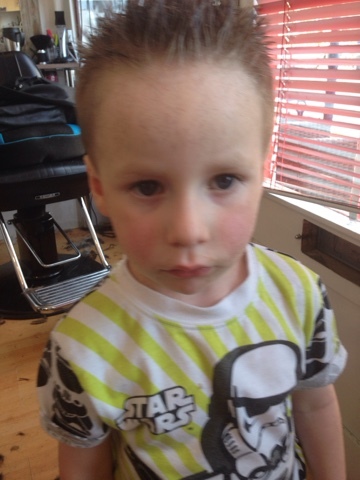 I didn't even need to panic about asking for a particular style - I just blurted out short back and sides and, after offering the children lollipops, away she went. Phyllis's is brilliant. It's a small, very traditional barber shop. The price list is very basic and runs along the lines of: men's cut, boy's cut, beard trim. There are two traditional barber shop chairs and she uses a booster seat for the small ones. To keep people occupied while you wait, there is a fish tank and a bookshelf with plenty of children's books along with magazines and newspapers. The wall is full of Elvis Presley posters and she listens to 50s rock music on a small jukebox style CD player as she trims and cuts. 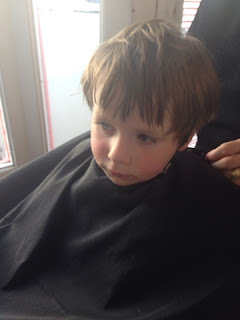 This was Wilfred's first visit to a barber shop and he was brilliant. He can be quite reluctant in new situations and it often takes a little time for him to be happy to participate in new activities. But, after watching his big brother have his hair done, he was happy to sit still in the chair an allow Phyllis to use her buzzy trimmer, even round his ears. 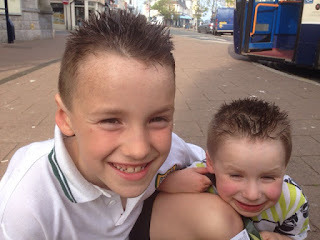 We are very happy with the results - two boys with the same haircut. And both were very happy that she styled their hair with wax. Do your boys have a particular hair style?